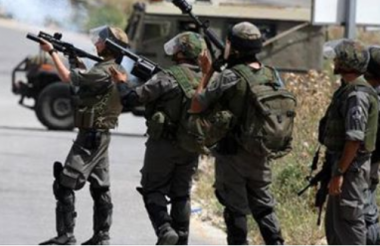 Israeli soldiers invaded, on Sunday evening, Beit Ummar town, north of the southern West Bank city of Hebron, clashed with local youths, and caused many Palestinians to suffer the severe effects of teargas inhalation. The soldiers invaded ‘Aseeda area, and attacked nonviolent Palestinian protesters, marching in solidarity with the Al-Aqsa Mosque amidst escalating Israeli violations. The army then fired dozens of gas bombs, causing many Palestinians to suffer the severe effects of teargas inhalation. In related news, the soldiers closed Huwwara military roadblock, south of Nablus, without providing any explanation, forcing the Palestinians to take longer alternative roads. Israeli soldiers shot and abducted, on Sunday evening, two Palestinians with live fire, during clashes near the Annexation Wall in Jayyous town, east of Qalqilia, and at the al-Hamra roadblock, in the West Bank’s Northern plains, and injured seventeen others with rubber-coated steel bullets and gas bombs. The WAFA Palestinian News Agency has reported that the soldiers shot Mahmoud Mohammad Qaddoumi, 15, with live fire, and prevented Palestinian medics from approaching him, before abducting and taking him to an unknown destination. The Palestinian Red Crescent (PRC) said its medics provided treatment to three Palestinians, who were shot with rubber-coated steel bullets, and fourteen others who suffered the effects of teargas inhalation. The PRC added that the soldiers also shot one Palestinian with live fire, near the al-Hamra military roadblock, in the Northern Plains. It also stated that the soldiers detained its medics and the wounded Palestinian, and later abducted the wounded man after refusing to allow the medics to take him to a hospital. The Israeli police attacked on Sunday evening the Jerusalemite worshipers protesting at Bab al-Asbat near al-Aqsa Mosque for the 8th day in a row in rejection of the metal detectors installed at the Mosque's gates. The PIC reporter said that the police forces tried to disperse worshipers by targeting them with sound bombs; however, the worshipers insisted on continuing the sit-in and performing evening prayer at Bab al-Asbat. 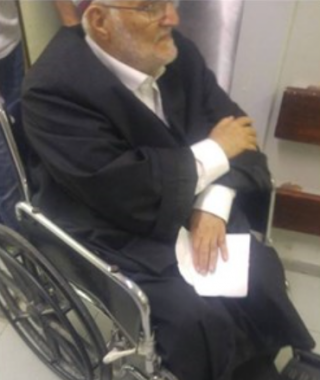 The Palestinian journalist Mohammed al-Sadiq was injured during the confrontations for the second time since the beginning of the sit-in eight days ago. Earlier in the day, 25 citizens, including two journalists, were injured after they were targeted with rubber bullets and tear gas canisters in clashes with the Israeli police in Abu Dis town and at Qalandia checkpoint in Occupied Jerusalem. The Israeli authorities on 14th July banned Friday prayer at al-Aqsa Mosque following an anti-occupation shooting attack in which two Israeli police officers were killed. The Old City was closed later and prayer was banned at the shrine until further notice for the first time since 1969, and on 16th July, 9 metal detectors were erected at al-Aqsa gates. Since then, Palestinian worshipers have refused to enter the Mosque through these metal detectors and decided to perform their prayers at its entrances. 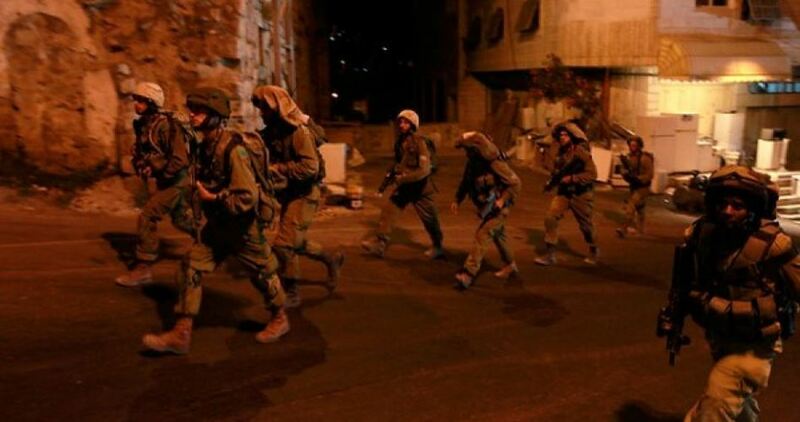 Israeli soldiers invaded, late on Saturday evening and on Sunday at dawn, several communities in the northern West Bank governorates of Jenin and Qalqilia, before storming and violently searching homes, and abducted three Palestinians in Jenin, and eight in Qalqilia. 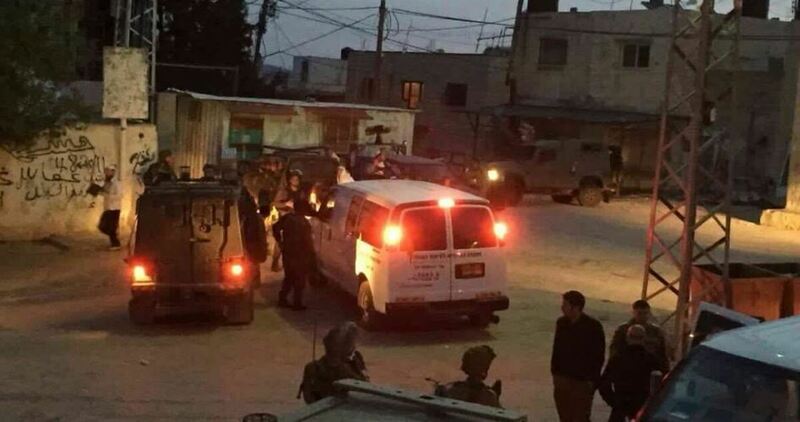 The soldiers also abducted one Palestinian in Bethlehem. The Jenin office of the Palestinian Prisoners’ Society (PPS) said the soldiers abducted two former political prisoners, identified as Abdul-Salam Abu al-Haija, 36, and Ghassan Zogheibi, 44, from their homes in Jenin city and Jenin refugee camp. 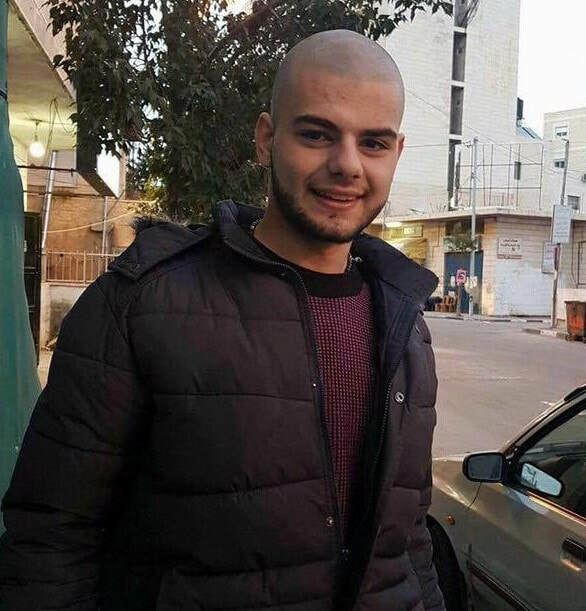 It added that the soldiers also abducted a young man, identified as Abdul-Rahim Fakhri Ghawadra, 21, from Be’er al-Basha village, south of Jenin, after stopping him at a sudden military roadblock, installed on the Jenin-Nablus road. Furthermore, the soldiers invaded many homes and neighborhoods in Qalqilia city, and abducted five Palestinians, identified as Mohammad Hashem Khader, 42, Abdul-Nasser Raby, 47, Mohmmad Bilal Freij, 25, in addition to Mos’ab Omar Ateyya, 20, and his brother Moath, 18. 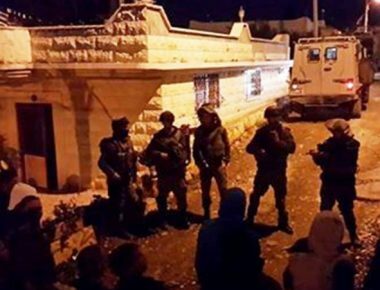 The soldiers also invaded al-Khader town, south of Bethlehem, and abducted Waleed Khader Salah, 27, after breaking into his home and searching it. In addition, the soldiers invaded Wad Shahin area, in the center of Bethlehem city, and summoned Issa Mousa al-‘Obeyyat, 50, for interrogation in Etzion military base, south of the city, after breaking into his home and searching it. Late on Saturday at night, the soldiers abducted Khaled Odah, Hamza J’eidi and Khaled Abu Shehab, allegedly for participating in clashes with the soldiers near a military roadblock, north of Qalqilia. 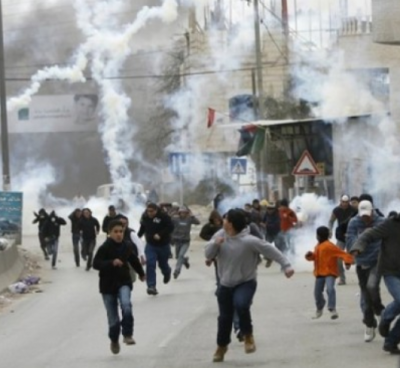 Medical sources said Five Palestinians suffered the severe effects of teargas inhalation. 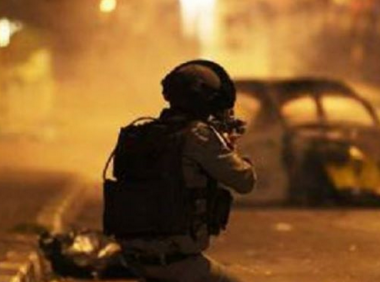 On Saturday evening, the soldiers injured 57 Palestinians in occupied East Jerusalem. The Palestinian Red Crescent Society (PRC) said most of the wounded Palestinians were injured by rubber-coated steel bullets and concussion grenades, and that twelve of them were moved to hospitals for further treatment. A Palestinian youth was pronounced dead on Saturday evening after he was injured in clashes with the Israeli police in al-Eizariya town in Jerusalem. A local source reported that Yousuf Kashour, 24, died of a serious injury to the chest. 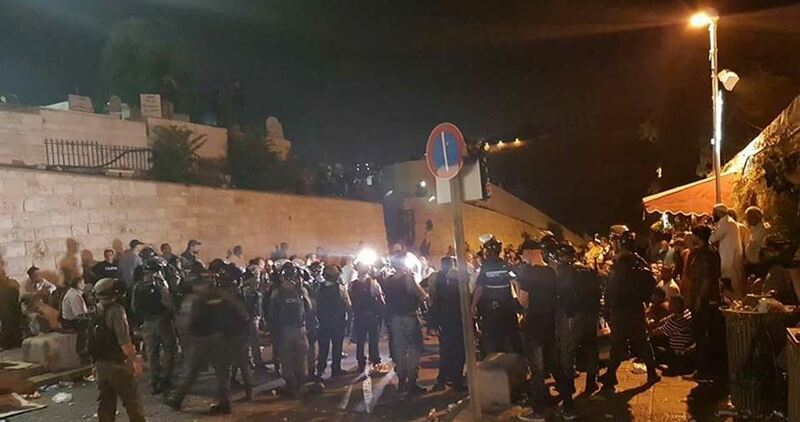 Violent confrontations erupted on Saturday evening between the Israeli police and the Jerusalemite worshipers protesting at Bab al-Asbat near al-Aqsa Mosque. The PIC reporter said that the Israeli police attacked worshipers with sound bombs and putrid water, and added that a cordon was later imposed around the scene after large police reinforcements were summoned in a bid to prevent worshipers from performing evening prayer there. Earlier, 3 Palestinians were injured with rubber bullets in clashes with the Israeli police at Qalandia checkpoint in Jerusalem. The Palestinian Red Crescent Society announced that its crews treated 67 injuries this evening in Jerusalem. Head of the Heritage and Manuscripts Department at al-Aqsa Mosque, Radwan Amr, said that the Israeli police assaulted worshipers and started to force them out of the Old City of Jerusalem, describing what is happening at al-Asbat as a "real massacre against a peaceful sit-in". Despite the Israeli attacks, hundreds of Palestinians coming from Jerusalem, the West Bank and the 1948 occupied territories protested for the 9th day in a row at Bab al-Asbat and outside the Old City against closing al-Aqsa Mosque and installing metal detectors at its gates. On 14th July, the Israeli authorities banned Friday prayer at the Mosque following an anti-occupation shooting attack in which two Israeli police officers were killed. Later, the Old City was closed and prayer was banned at the shrine until further notice for the first time since 1969, and on 16th July, 9 metal detectors were erected at al-Aqsa gates. Israeli Occupation Forces (IOF) rounded up Saturday afternoon a 24-year-old Palestinian girl, Safa al-Manasra, at the entrance to Bani Naim town east of al-Khalil. IOF soldiers also opened fire at a Palestinian car during an attempt to arrest a young man in al-Khalil city. Local sources told Quds Press that the family of the detained girl, who has a brother imprisoned in Israeli jails, affirmed that their daughter was arrested under the pretext of not carrying her ID. In another context, Israeli Special Forces opened gunfire at a Palestinian car at the southern entrance of al-Khalil city in a bid to arrest the youth driving it, but he managed to escape the scene. 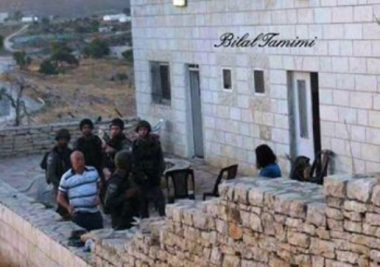 Israeli Occupation Forces (IOF) at dawn Saturday raided Hares town near Salfit city in the northern West Bank. The PIC reporter quoted local sources as saying that Israeli occupation patrols broke into the town and IOF soldiers were intensively deployed in the streets. IOF troops unleashed gunfire and stun grenades as they stormed the town. The soldiers searched the homes of the inhabitants, especially on the town's outskirts, the PIC reporter pointed out. Three Palestinians were reportedly shot and killed during clashes in occupied East Jerusalem and the occupied West Bank on Friday, sources told Ma'an, amid large-scale clashes across the occupied Palestinian territory over new Israeli security measures at the Al-Aqsa Mosque compound. 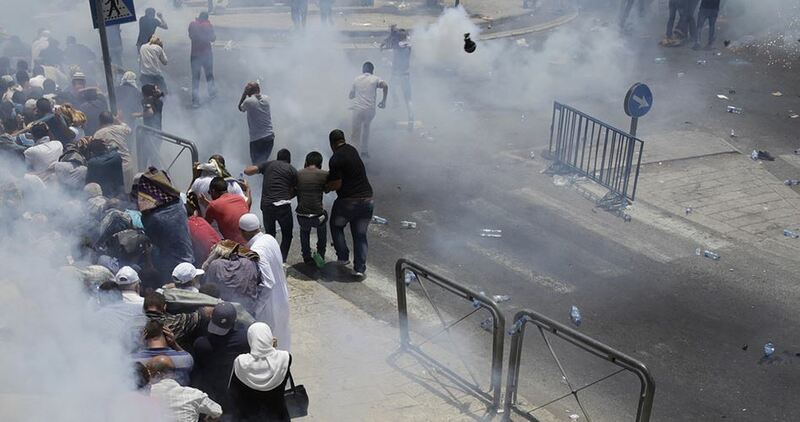 The deaths comes amid a large-scale demonstration across East Jerusalem on Friday to denounce new Israeli security measures at the Al-Aqsa Mosque compound following a deadly attack last week. Israeli forces have violently suppressed the protest in East Jerusalem, as well as other solidarity marches in the occupied West Bank and the besieged Gaza Strip, as the Palestinian Red Crescent told Ma'an that at least 193 Palestinians had been injured in East Jerusalem and the West Bank on Friday. According to Ma'an documentation, 49 Palestinians have been killed by Israelis in 2017, 14 of whom in the month of July alone. A Palestinian teenager was killed during clashes in the East Jerusalem neighborhood of Ras al-Amoud, medical sources told Ma'an, as witnesses said that the youth was shot by an Israeli settler. The youth was identified as 18-year-old Muhammad Mahmoud Sharaf from the neighborhood of Silwan. Witnesses said Sharaf was shot in the neck by an Israeli settler, and later succumbed to his wounds. Very shortly after his death, mourners carried out Sharaf's funeral, out of fear that Israeli authorities might confiscate his body, as participants chanted slogans about the teenager and Al-Aqsa. Meanwhile, another Palestinian, identified by medical sources as Muhammad Abu Ghanam, succumbed to his wounds in al-Makassed hospital after being shot by Israeli police forces during clashes in the Jerusalem neighborhood of al-Tur. Witnesses said that Israeli forces raided the hospital on Friday afternoon looking to detain Palestinians who were injured during the clashes. A Ma'an reporter on the scene said that a funeral was also promptly held for Abu Ghanam, as Palestinians were filmed hauling his body over a wall surrounding the al-Makassed hospital to avoid Israeli forces confiscating it. Witnesses said that Israeli forces fired sound bombs in the cemetery of al-Tur during the funeral. Locals told Ma'an that Abu Ghanam was a 20-year-old resident of al-Tur and a second-year student at Birzeit University. Later on Friday afternoon, the Palestinian Ministry of Health said a Palestinian succumbed to his wounds in a hospital in Ramallah after having been shot in the chest by Israeli forces during a demonstration in the village of Abu Dis in the Jerusalem district of the West Bank. 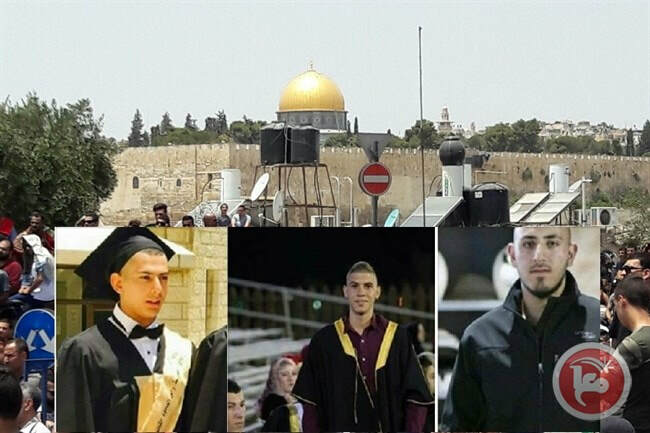 The slain Palestinian was identified by local sources as 17-year-old Muhammad Mahmoud Khalaf, whereas other sources identified him as Muhammad Lafi. DFLP added that Khalaf and his family were affiliated with the leftist movement, adding that the young man had recently passed his end-of-high-school tawjihi exams, and had led the student committee in the Arabic Institute in Abu Dis. At least 42 Palestinians were injured on Thursday evening when Israeli occupation forces quelled scores of sit-inners near al-Asbat gate of al-Aqsa Mosque. The PIC reporter revealed that Israeli forces opened gunfire at the sit-inners resulting in the injury of many of them. The sit-in, however, went on, he pointed out. Two of the wounded were in critical conditions as they were hit in the chest by rubber bullets. All of the injured were taken to hospitals, according to the Palestinian Red Crescent Society. The society also revealed that Israeli troops threatened its teams and banned them from approaching al-Asbat gate and Wadi al-Joze area. An Israeli soldier was moderately injured in the clashes that erupted in the vicinity of al-Aqsa Mosque, the PIC reporter said. The protesters chanted slogans affirming insistence on holding protest events and sit-ins as well as refusing to pass through metal detectors into the holy compound. 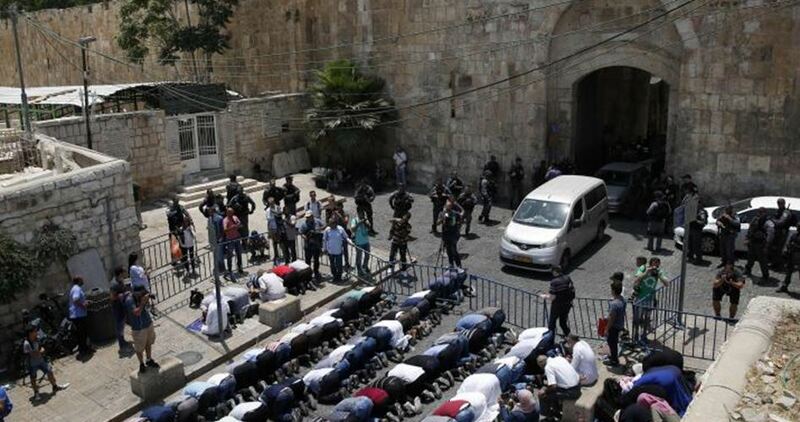 They also demanded that Israeli occupation authorities revoke their racist measures and practices at the holy shrine. Clashes were also reported in al-Sahera gate at al-Aqsa Mosque and in al-Ram town north of Occupied Jerusalem, according to eyewitnesses who affirmed that an Israeli chopper was used to help in besieging the worshipers and sit-inners at the holy site. Jerusalemite worshipers were assaulted on Wednesday by the Israeli police after performing noon prayer at Bab al-Asbat outside al-Aqsa Mosque in protest at the metal detectors installed at the entrances of the site. The PIC reporter said that worshipers were violently attacked and showered with tear gas canisters. Two worshipers were severely beaten before being arrested and transferred to an Israeli detention center in the Old City of Jerusalem. The Israeli police claimed in a statement that worshipers shouted "provocative slogans" and threw stones at the police. Violent clashes broke out on Wednesday between Israeli Occupation Forces (IOF) and Palestinian students of Birzeit University at Attarah military barrier north of Ramallah. The PIC reporter revealed that the clashes followed a sit-in held in the afternoon in campus by the university students in solidarity with al-Aqsa Mosque. 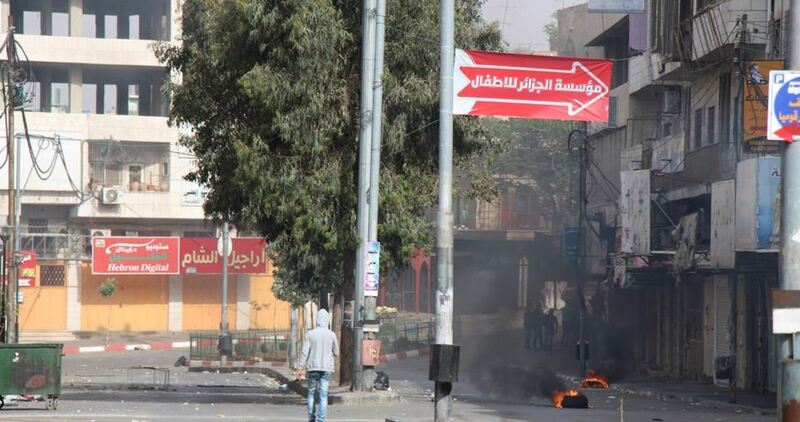 The students who participated in the sit-in called for supporting al-Aqsa Mosque and headed to Attarah military checkpoint where the clashes erupted. Israeli soldiers invaded, on Wednesday at dawn, the villages of Deir Ghassana and Nabi Saleh, northwest of the central West Bank city of Ramallah, attacked several Palestinians in their homes, before abducting three young men, and wounding a family. The soldiers invaded Nabi Saleh from various directions, before storming and ransacking homes, and abducted Anan Naji Tamimi, 21, and Omar Saleh Ayyoub, 31. The soldiers attacked the families of the two detainees, in addition to invading the home of Mahmoud Tamimi, before assaulting him and his family, causing various cuts and bruises; local medics rushed them to a hospital in Ramallah. Furthermore, the soldiers invaded Deir Ghassana village, and abducted Majd Abdul-Basset Sho’eibi, after storming his home and assaulting him along with his family. Several Israeli military jeeps invaded, on Tuesday at night, the town of al-‘Ezariyya, east of occupied East Jerusalem, and clashed with local youngsters, wounding sixteen. 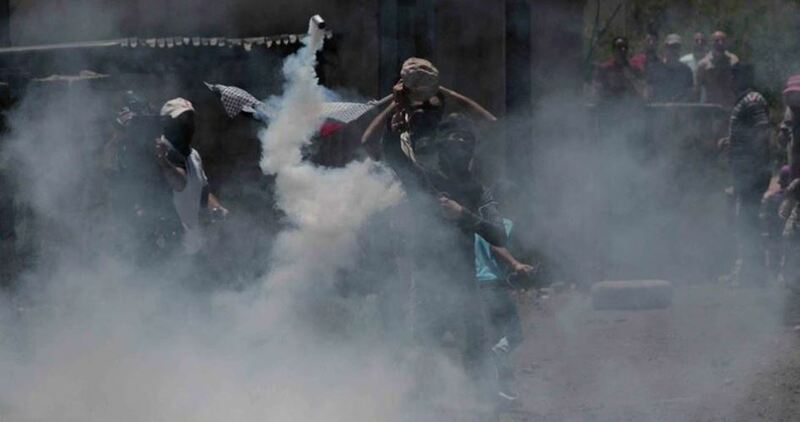 The Palestinian Red Crescent (PRC) said its medics rushed to the town, and provided the needed treatment to eleven Palestinians, who suffered the effects of teargas inhalation, three who were shot with rubber-coated steel bullets and two others who suffered burns. Palestinian Red Crescent (PRC) medics have provided medical treatment to 34 Palestinians, including the Khatib of al-Aqsa Mosque in Jerusalem, and moved at least fourteen others to hospitals, including one who suffered a serious injury, after Israeli soldiers attacked dozens of Palestinians in the Tribes Gate area, and Jerusalem’s Old City. The soldiers fired dozens of gas bombs, concussion grenades and rubber-coated steel bullets at the Palestinians who gathered in the streets to perform evening prayer, after preventing them from entering al-Aqsa Mosque. The PRC said one of the wounded Palestinians was shot with a live round in the chest, and is currently in a serious condition. It added that the Khatib of the Al-Aqsa Mosque was shot with a rubber-coated steel bullet in the back, in addition to suffering various cuts and bruises. The soldiers also fired a concussion grenade at a PRC ambulance, in addition to attacking medics in another ambulance.